On March 23, Angel and Chris with Teavivre paid a visit to an organic tea garden in Hangzhou and brought back some beautiful pictures of this green garden. After a leap month and a warm winter in last year, spring days joining hands with warm freshness comes earlier than usual in 2015. Just after a relaxed period of Chinese New Year, Tea farmers in Bao Jia village are actively preparing for a new spring tea harvest. On 23 March, Angel and Chris, two tea enthusiasts, have made a journey to Bao Jia organic tea garden, located at Hangzhou, East China. Yu Hang District in north Zhejiang province is the birth place of Liangzhu culture – the dawn of Chinese civilization – is famous for the title of “a land abounds with fish and rice” and “the land of silk”. Far from city, without air and water pollution, the advantageous natural conditions make these small hills hold incomparable ecological environment for high quality tea plantation. March 23, a sunny day. We finally arrived at this green garden and got a rare opportunity to see how those tiny buds are picked and touch them and smell them in zero distance. “picking fresh leaves is a skilled job” Angel was told “ hold the middle part of a stem in a tight grip between the thumb and index finger then nip it off with a quick compressing force”. 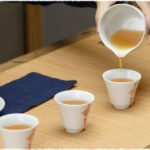 “Longjing tea is famous for its tender leaves and fresh taste, our organic She Qing Longjing is early spring tea（头春茶）,made of one bud or one bud with one leaf” explained by one tea picker. Tea cultivation needs appropriate growing conditions. Bao Jia organic tea garden is located in hilly areas. There are good ecological environment and view around; the fertile latosol red soil and high hypsography make the ventilation and drainage well. Abundant rainfall and sunlight, small year temperature difference, long frost-free period and big day and night temperature difference, all these conditions are suitable for tea plants and contribute to premium teas here. Located in the transition between Hangjiahu plain and east Zhejiang hilly area, the area of Bao jia organic tea garden affected by north subtropical monsoon climate has a long winter and summer and four distinct seasons. The annual average temperature is about 16℃, the average annual rainfall can reach 1,150 – 1,550 mm. Drawing in deep breaths of the scented air, leaded by local tea farmer we are on the trail studded with tiny purple unknown wild flowers around to a near hill. Just like free birds, we are happy and excited. What a wonderful spring! After a lunch with hospitable local tea famers, we are invited to see how Longjing tea is processed for the first time. Freshly fired She Qian tea looks greenish-yellow in color, having an even shape, Ming Qian tea looks more yellow and broken but all are the premium spring tea, sharing the same quality grade. Organic Nonpareil She Qian Long Jing Tea has a beautiful shape (greenish, whole flat leaves with sharp edge) and fresh, brisk mouthfeel followed by quick sweet aftertaste. In a sunny afternoon, slowly taste a cup of organic long Jing tea with several sips, close your eyes and then breath silently you may feel the inner peace free from the hustle and bustle of the city life. Spring tea fragrance filled the nightfall air, a little bit of cold breezes reminded us immediately the return time is near. We reluctantly saw off our best friends and embarked on the return journey to home. Good-bye Bao jia organic tea garden, hope we meet sometime next year. Thanks so much. 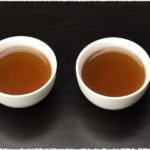 Really enjoy these type of articles as they are informative and provide a nice sense of the effort the farmers and Teavivre go through to provide us the opportunity to enjoy these fine teas. 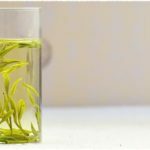 PreviousPrevious post: What do you know about spring tea?